Each year until at least 2022 we need to grow our retail revenue and profitability by 10% or greater. 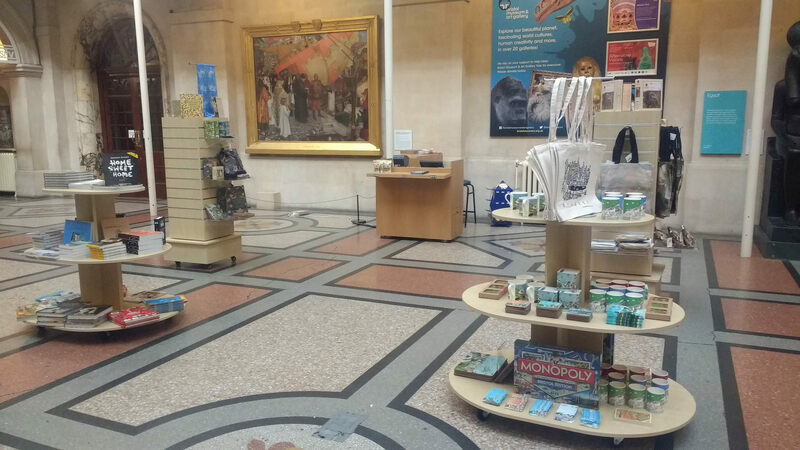 At Bristol Museum & Art Gallery our retail is typical of the sector in converting about 10% of visitors into shoppers. For us, this will not be enough to do what we need to do. But we must hit our target. The problem should be obvious…. an average is basically an assumption that IF A + B + C happens then success! It is good to have a working set of data, averages and assumptions to use as a baseline but we can’t run our retail on assumptions and need to try everything to maximise sales. I know that to have more confidence in our programme we need to keep poking the box to try to positively increase our conversion and thus sales. The best way to get the conversion up to is raise awareness to the visitor that we have a shop offer and try to affect behaviour. Our front hall has 100% of our visitors passing through. During the summer holiday we’re testing the idea that more exposure should increase sales by introducing a small shop located in the front hall. This project will inform our future plans for growing the retail business which may include moving the location of the main shop. A visually attractive retail offer located in the front hall will undoubtedly increase awareness of a retail offer in the Museum. Although improvements have been made to the entrance of the main shop including introducing a large bookstand and jewellery stand, some visitors still miss the retail offer. This project will hopefully encourage impulse buying and whilst signposting to the main shop either now or for Christmas. There will be almost no investment costs, as we already have the equipment needed to set up a small shop. Staff costs will be met using the current budget by moving the second retail assistant to the front hall. The downside of course will be less ability to deal with deliveries and some customers who want assistance. The shop in the front hall will be open daily during summer school holidays 24th July -1st September and be mobile enough to be able to close and move for any evening events. The space taken for the shop would measure 9ft (2.7 mtrs) by 11ft (3.4 mtrs). Meeting the potential for growth – going on last year’s August figs of ATV at £6.18 an increase of 5% conversion could lead to an increase £10,000. So how did we do the first week? Sales in the front hall accounted for 13% of sales. The first two days we were finding our feet so i’d expect this to increase in the coming week. At this stage we can’t tell if this has simply taken a share of the main shop’s sales or increased sales overall… we need to compare a few data sources and experiment with the product range…. watch this space! Like the transparency on what you’re doing here. As a next phase, working on the assumption, sriving footfall to the main shop will increase conversion of overall visitor numbers, how about a kids sheet to find the clues throughout the museum to redeem a free gift at the shop with a purchase? I’ve already done that recently on the Hidden Museum app. The thing is that at the moment the conversion for kids sales is very good. Its the £25+ bracket I need to really make a difference. We have to sell a lot of marbles or 1-2 earrings! That being said, at M Shed conversion is 50% less than it should be so a trip via the shop would be good!